Spray large cookie sheet with cooking spray; line with cooking parchment paper or waxed paper. In large microwavable bowl, microwave chocolate chips uncovered on High 2 minutes, stirring after each minute. Continue microwaving and stirring in 15-second intervals until melted and smooth. Pour melted chocolate onto cookie sheet. Use spatula to spread evenly into 10x13-inch rectangle, about 1/4 inch thick. In small microwavable bowl, microwave white vanilla baking chips uncovered on High 30 to 60 seconds, stirring every 15 seconds, until melted and smooth. Drizzle over chocolate layer on cookie sheet. 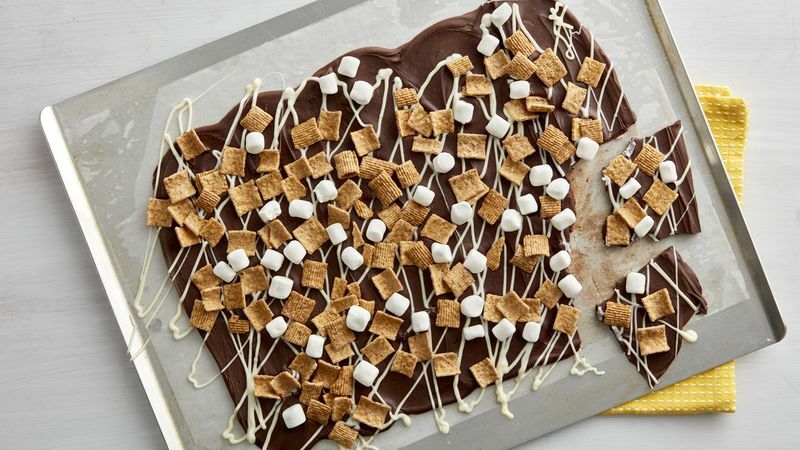 Immediately sprinkle cereal and marshmallows over top; press into melted chocolate to help pieces stick. Refrigerate uncovered about 30 minutes or until firm. Break into pieces. Store covered in refrigerator. Spraying the cookie sheet with cooking spray before placing the parchment paper on top helps the paper stay in place while spreading the chocolate. Pay special attention when melting chocolate in the microwave -- scorching or burning can happen very quickly.